The vaccine causes autism debate will now be front and center for years to come as US Health and Human Services Secretary Kathleen Sebelius confirms that the Swine Flu (H1N1) Vaccine will be laced with the mercury based preservative thimerosol. "study after study, scientist after scientist, has determined that there really is no safety risk with thimerosol. There is concern about parents of why autism rates are rising. And, as you know, we've got some special NIH studies, thanks to the president, focused on just what is going on. But thimerosol has been proven to be safe. It's used in seasonal vaccine-- seasonal flu vaccine. And, again, we want to assure people that that-- the scientists, again, have confirmed-- that there is really a safe factor with using thimerosol. It's an effective preservative and one that we think actually adds to the likelihood that we'll have a safe vaccine for a while to come. based on the science. And the science, again, continues to indicate that the ingredients we're anticipating using in this vaccine are safe to use." The article Web Exclusive: Sebelius on Vaccine Fears does not indicate what studies Secretary Sebelius relies upon to assert that the science shows that thimerosoal is safe and does not cause autism. Given that pregnant women will be targeted it appears that the swine flu vaccine program will essentially be an experiment which could result, or not, in a new wave of autism diagnoses in the children of women receiving the swine flu vaccine. I hope that Secretary Sebelius is right in the result but I believe she has overstated the "science" supporting the safety of thimerosol and the alleged lack of any link to autism disorders. "CBS News has learned the government has paid more than 1,300 brain injury claims in vaccine court since 1988, but is not studying those cases or tracking how many of them resulted in autism. The branch of the government that handles vaccine court told CBS News: “Some children who have been compensated for vaccine injuries…may ultimately end up with autism or autistic symptoms, but we do not track cases on this basis.”"
There you go. First authorities do not research or track possible vaccine related autism cases. Then they claim the science does not support a vaccine autism link. And vaccine programs like the impending Swine Flu program are reported on the basis of "science" to be safe with no autism connection. See no autism, hear no autism, speak no autism. I try to keep this blog site focused on autism and I try to keep it non-partisan despite being a life long Liberal. (With Prime Minister Stephen Harper washing his hands of Canada's autism crisis it is hard to present non-partisan commentary about federal autism initiatives. or lack thereof). In recent elections, provincially and federally, I have shifted toward a strategic voting mind set voting for the candidate, and the party, that is most likely to represent hope for autistic children and adults. As someone who has been a Liberal though I am seriously disappointed by the autism record of the Ontario Liberal government of Dalton McGuinty. I am proud of New Brunswick's political leaders, both Conservative and Liberal, for what they have done on behalf of autistic children although much remains to be done. Both Conservative and Liberal governments in New Brunwick have failed to date to address the crisis in adult autism residential care and treatment. 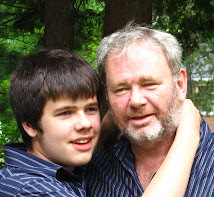 One of the best things that happened to my autistic son Conor, was moving from the Toronto (Burlington) area back to New Brunswick in 1997, the year before he received his autism spectrum disorder diagnosis at age 2. 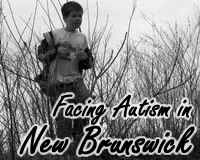 At that time there was little in the way of autism services available here in New Brunswick. Determined and focused parent advocacy, access to amazing, community involved academic and professional help and conscientious, responsive political leaders from both Conservative and Liberal parties, have resulted in an autism service delivery model for autistic children in this relatively poor province that has earned national and international recognition. Such sweeping change for the good of autistic children has not taken place in the much larger, and wealthier, province of Ontario. 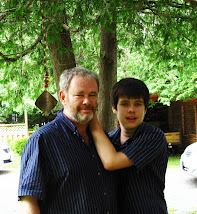 Had we stayed in Ontario in 1997 Conor would not have enjoyed the autism services he has received here in NB. 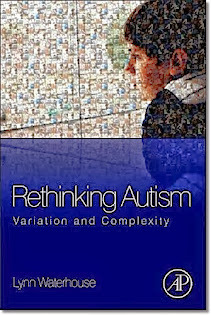 Liberal Premier Dalton McGuinty may be many good things but he has not been a friend of autistic children in Ontario. of their son and with the high cost of private ABA therapy. hours a week of one-on-one instruction-beginning in their early years. son into her parents' home in Thornhill to save on cost-of-living expenses. worries about how she'll pay for Jaiden's future therapy. gained, and failing at school and in adulthood." participate in the provincial government's subsidized IBI program. is, they are waiting to qualify to get on the IBI program waitlist. equals pay much more later." the autism crisis in Ontario. dollars more down the road to sustain these individuals as adults. A leading public health expert is calling on Canada to create a no-fault compensation program for people who may be harmed by a swine flu vaccine that millions of Canadians will be urged by the government to get this fall. Kumanan Wilson, Canada research chair in public health at the University of Ottawa, said in an interview with Canwest News Service that children and adults could be exposed to an incompletely tested vaccine and that a compensation scheme is needed to encourage the public to buy into any mass immunization program. When the World Health Organization last month proclaimed swine flu the first pandemic since 1968, Canada’s chief public health officer, David Butler-Jones, said everyone should get the new flu shot when it becomes available. “The more people that have immunity, the easier it is to stop,” he said. But Canwest News Service has learned that, unlike the United States, the Public Health Agency of Canada has no plans to compensate people who may be injured by an H1N1 vaccine. A vaccine injury program would give people who suffer an adverse reaction faster access to compensation without having to go through the legal system. Quebec is the only jurisdiction in Canada that has a non-fault compensation program. Public Health Agency of Canada officials acknowledged last week there won’t be time for a swine flu vaccine to go through standard safety testing before immunizations begin in the fall. The first doses are expected to be available in three to four months. Officials said they are working with regulators on ways to reduce any time required for getting the vaccine out. Canada could invoke emergency provisions to get the vaccine out quicker, before all the data from human trials that test safety are complete. Hopefully Canadian governments will enact a true no-fault compensation system for those injured by the swine flu (H1N1) vaccine and will at least fully and accurately record what happens to those, particularly pregnant women and young children, who receive the untested vaccine shots. Specifically, given some evidence that the swine flu (H1N1) virus has itself been linked to autism, governments should keep reliable records on autism diagnoses amongst children receiving the swine flu vaccine, or children born of mothers who received the vaccine while pregnant. Would it be too much to ask governments to keep such records and make the resulting information available before relying on the old "correlation does not imply causation", or "it's just a coincidence" arguments to mock those who see their children regress into autism after vaccination? In Swine Flu Vaccines, Autism and Public Health Gamblers I commented on the gamble underway in Europe where the the European Medicines Agency is allowing companies to skip testing in large numbers of people before the vaccine is approved, a step that was admitted to be a gamble by Europeon Officials. Now comes word, as reported on Bloomberg.com, that US officials are considering their own gamble permitting vaccine manufacturers to to use experimental, untested, additives to increase supply of swine flu vaccine shots. These authorities may be making a decision they have to make to prevent swine flu deaths. And they may be causing other types of damage. What the public health authorities should stop doing is trying to pretend that vaccines are inherently safe and that they can not cause neurological damage including autism. They should stop maligning parents who question vaccine safety and who argue that their child's regression into autism immediately after vaccine shots is more than a simple coincidence. They should start addressing their concerns seriously and stop playing cheap games such as occurred when , as reported at Age of Autism, parents were excluded from IACC hearings after several hours waiting, in some cases with their autistic children. Vaccine programs are vitally important public health tools. But they should not become golden calves worshipped and placed high on an alter above and beyond public criticism and free expression. CanTitanium Dioxide Nanoparticles Trigger Autism? Add Titanium Dioxide Nanoparticles to the growing list of possible environmental triggers or causes of autism spectrum disorders. The die hard proponents of the belief that the astounding increases in rates of autism diagnosis are entirely due to changes in diagnostic criteria, increased awareness and other social considerations will be disappointed to learn of yet another possible environmental trigger or cause of autism spectrum disorders. The researchers, led by pharmaceutical sciences Professor Ken Takeda, said genes affected by titanium dioxide nanoparticles are associated with childhood disorders such as autism, epilepsy and learning disabilities. Nanotechnology deals with engineering at the molecular scale. Materials reduced to nanoparticles behave in ways dissimilar to those we're used to, altering their reactivity, surface area to volume and other properties, the researchers said. It seems that, all too often, new technologies emerge, are widely distributed to a consuming public and are tested later for health and safety implications. Make it, use it, test it later for possible harm. Nanotechnology offers great promise in many industrial applications. However, little is known about the health effects of manufactured nanoparticles, the building blocks of nanomaterials. 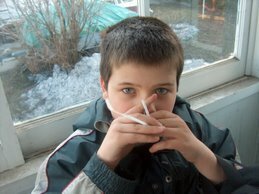 Can Swine Flu Alter Genes and Cause Autism, Alzheimer's and Schizophrenia? A genetic epidemiological researcher who has worked in statistical genetics at the National Human Genome Research Institute/NIH, has posted an article Swine Flu Can Change Genes of Unborn at Blisstree.com suggesting that swine flu in pregnant women may change the genes of unborn children resulting in damage to the hippocampus. Grace Ibay points out that damage to the hippocampus is associated with a number of mental disorders including autism, Alzheimer’s and schizophrenia. Ms Ibay refers to a study of pregnant mice injected with the swine flu (H1N1) virus published in the medical journal European Neuropsychopharmacology in which the newborn offspring had reduced hippocampus by 15% and 12 other altered genes. The journal article is Prenatal viral infection of mice at E16 causes changes in gene expression in hippocampi of the offspring in European Neuropsychopharmacology Volume 19, Issue 9, Pages 648-653 (September 2009). The article abstract comments generally that the hippocampus governs memory formation and emotional regulation, that there is widespread evidence of hippocampal dysfunction in psychiatric disorders, including schizophrenia and autism and that there is abundant evidence that prenatal viral infection may play a role in development of schizophrenia and autism. "significant changes in gene expression in the offspring .... including a number of candidate genes for autism and schizophrenia ... qRT-PCR verified the direction and magnitude of change for 5 of the genes from the microarray data set and revealed mRNA changes for additional genes associated with schizophrenia and autism." Ms Ibay, who is reported to be the mother of young children in addition to being a genetic epidemiological researcher, refers to this study as confirmation of the public health recommendation that pregnant women be vaccinated against the H1N1 (swine flu) virus. She makes no mention of any possible damage to the genetic makeup of unborn children that might result from injecting their mothers with the H1N1(swine flu) vaccine. "In a drive to inoculate people against swine flu before winter, many European governments say they will fast-track the testing of a vaccine, arousing concern among some experts about safety and proper doses. The European Medicines Agency, the EU's top drug regulatory body, is accelerating the approval process for swine flu vaccine, and countries such as Britain, Greece, France and Sweden say they'll start using the vaccine after it's green-lighted — possibly within weeks. In an interview, Dr. Keiji Fukuda, the World Health Organization's flu chief, warned about the potential dangers of untested vaccines, although he stopped short of criticizing Europe's approach outright. "One of the things which cannot be compromised is the safety of vaccines," he said Friday. "There are certain areas where you can make economies, perhaps, but certain areas where you simply do not try to make any economies." The WHO has predicted there could be 2 billion swine flu cases worldwide this year and next, and the U.S. Centers for Disease Control predicts 40 percent of Americans might contract the virus. Flu vaccines have been used for 40 years, and many experts say extensive testing is unnecessary, since the swine flu vaccine will simply contain a new ingredient: the swine flu virus. But European officials won't know if the new vaccine causes any rare side effects until millions of people get the shots. Still, they say the benefit of saving lives is worth the gamble. "Everybody is doing the best they can in a situation which is far from ideal," said Martin Harvey-Allchurch, a spokesman for the European Medicines Agency. "With the winter flu season approaching, we need to make sure the vaccine is available." In Europe, flu vaccines are usually tested on hundreds of people for several weeks or months, to ensure the immune system produces enough antibodies to fight the infection. But to ensure swine flu vaccine is available as soon as possible, the European Medicines Agency is allowing companies to skip testing in large numbers of people before the vaccine is approved." The swine flu pandemic preparations prove some simple points in the vaccine autism wars - governments are more than willing to cut safety corners when it comes to vaccination of the public against contagious diseases. Safety testing before vaccine usage can be waived, and will be waived, if governments deems it necessary. And yet, parents concerned about vaccines and possible autism consequences, possible neurological damage resulting from vaccine usage, are branded as quacks and crackpots? As the quote above highlights fully, governments are more than willing to gamble, to take chances with the unintended consequences of vaccine injections, if such injections MIGHT prevent the spread of a deadly disease. But of course they would not attempt to cover up such consequences after the fact, would they? After all they do know in advance that UNTESTED vaccines will only produce RARE side effects right? Shame on me for ever doubting our public health gamblers. Autistic Children of Earth: Have Autistic Children Been Sacrificed for the Greater Good? SPOILER ALERT: Do not read this blog if you intend to watch Torchwood: Children of Earth but have not yet done so. 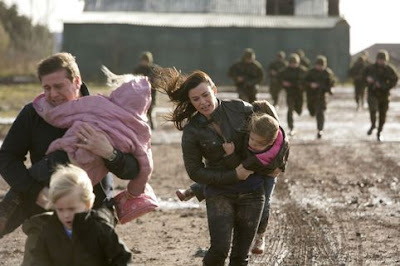 The BBC's 5 episode Torchwood: Children of Earth series played in Canada this week on the Space television channel. It was good science fiction, using the fantastic plot themes and story lines permitted by science fiction to ask serious questions about the nature of humanity and the difficult choices we make. In Children of Earth the world's leaders are required to decide whether to sacrifice 10% of earth's children to aliens ... for the greater good. The show prompted me to think of public vaccine programs designed to protect "the herd", at potential risk to some vulnerable subsets of children; children who might develop autism disorders after vaccination. In Children of Earth world leaders are forced by an apparently superior alien power to sacrifice 10% of the world's pre-pubescent children to the aliens who would keep them perpetually alive as units used in producing chemicals to which the aliens are addicted. Failure to do so will result in the destruction of all humanity. The alien menace arises from their ability to unleash deadly viruses that would wipe out all of humanity, viruses for which they hold the antidotes. The leaders confronted with this choice decide to make the sacrifice and then must decide which children will be delivered to the aliens. Their first thoughts are to use a random process, one which might result at least in some measure of fairness. Ultimately the leaders decide on a process which spares their own children and picks those children who, in their opinion, would end up being a burden on society for various reasons. The greater good argument appears often in the intense arguments about vaccines and autism. Parents who choose not to vaccinate their children are maligned as parasites and free riders. Questions are raised about the intelligence, even the rationality, of parents whose concerns arise from observation of autistic like regression immediately after vaccination of their children. A celebrity actress and mother like Jenny McCarthy who expresses vaccine autism concerns is demonized while celebrity actress and mother Amanda Peet who criticizes parents of children who decide not to vaccinate as parasites is idolized. The pressure to vaccinate our children is intense. There is of course no issue of children being sacrificed for the greater good if vaccines do not in fact cause harm to children. But that supposition is simply not true. Historically some children have been harmed by some vaccines. Public health officials will say that these instances are rare, which may be true, but is of little consolation to the child affected, or his or her parents. The big debate today is over the possible role of vaccines in causing autism disorders. Public health officials, vaccine patent holders and internet Neurodiversity bloggers alike join arms in mocking parents who rely on their own direct observation of their children's post vaccination regression into autism to argue that vaccines actually caused the autism that followed. Apparently the "correlation does not imply causation" or "it's just a coincidence" arguments have infinite shelf lives and can be used no matter how many times the coincidences and correlations occur. Mocking celebrities and parents is not sufficient though to beat concerned parents into submission. It is also necessary to ignore credible health officials, researchers and professionals who argue that the existing state of science does not actually disprove any connection between vaccines and autism. While Jenny gets much ink from the "vaccines are sacred and shall not be questioned" crowd Dr. Bernadine Healy and Dr. Jon Poling who have stated that some vulnerable children may incur autism from vaccines are all ignored. While the vaccine court decisions in which no vaccine autism connection is found are trumpeted far and wide .... and loudly the cases, like Banks and Poling, where the government folded its hand and settled before a media attracting court decision could ensue are ignored. I am not convinced that vaccines, and their ingredients, cause or contribute to instances of autism although I suspect they might in some cases just as I suspect other environmental triggers might be involved. I am no longer convinced though, as I once was, by public health official statements that the science is complete, that all the research has been done and that vaccines are not, and never are, involved in causing or triggering autism. When people like Dr. Bernadine Healy and Dr. Jon Poling argue that some autism cases might result from vaccination of some vulnerable children I am not inclined to disregard their comments. I do not know if children who develop autism after vaccination were sacrificed for the greater good but I also believe that the issue is far from decided. I do know the vaccine program will continue and hope that concerns of parents are addressed through research to prevent possible instances of autism and to enhance public confidence in the vaccine programs which have done so much good for so many. (UPDATE: It appears from reports late yesterday that Torchwood is being renewed for another season. The oppression of the Iranian people and their courageous stand of the past weeks is one non-autism story that I feel compelled to acknowledge on this autism dedicated site. Protests took place around the world yesterday protesting the Iranian regime's oppression of the Iranian people. Perhaps she senses that the battle is lost. Michelle Dawson is once again lashing out with the same stale anti-ABA rhetoric in An anomaly in autism intervention research. There is little new in this latest rant. First diagnosed as an adult "autistic" with an unspecified Autism Spectrum Disorder Ms Dawson has made a career out of opposing efforts by parents to obtain ABA treatment for their children. Together with her comrade in arms in anti-ABA activism, Dr. Laurent Mottron, Michelle Dawson has appeared before the Supreme Court of Canada, the Canadian Senate, several times before CBC cameras and microphones, and been interviewed numerous times, telling the world that she and Dr. Laurent Mottron know better than the US Surgeon General, the Association for Science in Autism Treatment, the MADSEC Autism Task Force, the New York State Department of Health, the American Academy of Pediatrics, the May Institute, the Center for Autism and Related Disorders, Inc. and of course the Lovaas Institute. * (not an exhaustive list) about the effectiveness of ABA as an autism intervention. And now she is at it again. ABA is not generally imposed on adult autistic persons. (Never to my knowledge) . The autism advocates that Michelle Dawson is referring to are parents of autistic children seeking to obtain the well documented benefits of ABA treatment for their children. Ms Dawson to my knowledge, is not herself a parent. She apparently believes that she, diagnosed as autistic as an adult, is better informed and has a greater right and responsibility, to determine what is good for autistic children than the parents of those children. Michelle Dawson is wrong. Again. *(Note: the May Institute, the CARD and the Lovaas Institute actually work with autistic children applying ABA, helping them overcome autism disorder deficits, and know what they are talking about from direct first hand experience). According to the Australian Broadcasting Company News two new independent studies from Melbourne's La Trobe University indicate that autism is on the rise in Australia. Official Australian estimates of 1 in 160 are now being challenged by the two studies one of which reports an incidence of 1 in 119 persons affected by an autism spectrum disorder diagnosis. A second study from La Trobe using much smaller study group reports a 1 in 100 figure. The usual "we don't know if the increase is real, or is the result of better diagnosis" stuff is quoted in the ABC News article. Maybe we should just assume that the increasing rates of autism in Australia, and elsewhere in the world, are due entirely to better diagnosis and increased awarness. Like the famous three monkeys we could cover our eyes and ears and ignore the autism epidemic. Perhaps like Dorothy from the other Oz we can just click our heels three times and wish that autism were not actually rising, that there were no environmental factors causing increases in autism. Or maybe we could do the research necessary to determine what environmental factors are causing the autism increases. We really don't need any wizards telling us it is all in our heads. The research identified differences in brain tissue known as cortical cell minicolumns, which connect brain signals to process information. In autistic people, there was an abundance of short connectors, but a deficiency of long ones which process complex information. Casanova analyzed MRI brain scans of 15 dyslexic patients and discovered that many traits of dyslexic brains were exactly opposite those of autistic brains.The autistic brains were larger, while the dyslexic brains were smaller, with fewer wrinkles. And the dyslexic brains had an abundance of long connections between cortical cell minicolumns, at the expense of short ones. Dr. Casanova's research is not just aimed at satisfying curiosity about the brains of persons with autism or dyslexia. Dr. Casanova is currently seeking funding for a clinical trial of high frequency magnetic wave therapy aimed at helping dyslexic persons make the short connections and read easier. He has already begun therapy trials with autistic persons using low frequency magnetic waves which the Courier-Journal reports are showing some success. Vaccine-Autism War: Will Beating Up Jenny and Oprah End the War? From Newsweek to Discover online to the self appointed protectors of science who contend that any questioning of the safety of injecting substances containing mercury, aluminum and biological agents directly into the blood of young children on dozens of occasions constitutes "woo" the Offit Offensive has rolled out with a vengeance lashing out at Jenny McCarthy and Oprah Winfrey for the attention they bring to parents' concerns about vaccine safety. Will these vicious personal attacks convince those parents who have seen their children regress into autism after vaccination? I doubt it. I doubt it very much. If the self styled anti-woo brigade really wants to persuade parents that their concerns about multiple injections of potentially toxic chemicals and biological agents into their children's bloodstream is risk free they should change course. Stop repeating the same failed tactics over and over and over again. Do the comparison study of vaccinated and unvaccinated populations that credible health authorities like Dr. Bernadine Healy, Dr. Julie Gerberding, Dr. Duane Alexander and neurologist, university professor, "autism dad" and successful vaccine autism litigant, Dr. Jon Poling have all said could and should be done. Dr. Paul Offit and others should stop the silly name calling. You will change no minds with such foolishness. Stop playing in the "woo" and do the credible studies to change minds. If you want to stem the tide of concern over vaccine safety do the research that will convince people of vaccine safety .... or start accepting your own responsibility for continued public suspicion over the safety of vaccines. If you are interested in new developments in autism self advocacy and awareness and want to avoid the tired "we don't want to be cured" ideology check out those who are presenting new perspectives in autism self advocacy. Jonathan Mitchell, Autism's Gadfly, and Jake Crosby at Age of Autism don't take their cues from the Neurodiversity playbook. Another vital new point of view is offered by Stephanie Lynn Keil an artist and person with an autism disorder who doesn't subscribe to the old rhetoric of Sinclair, Dawson, Baggs and Ne'eman. "I can't wait for society to accommodate me: I need to accommodate myself to society now. I can change myself in much less time than I can change society, which is why I am taking this route." Stephanie's views are anathema to those who promote autism disorders as social constructs, natural variations, a different, even superior, ways of thinking. 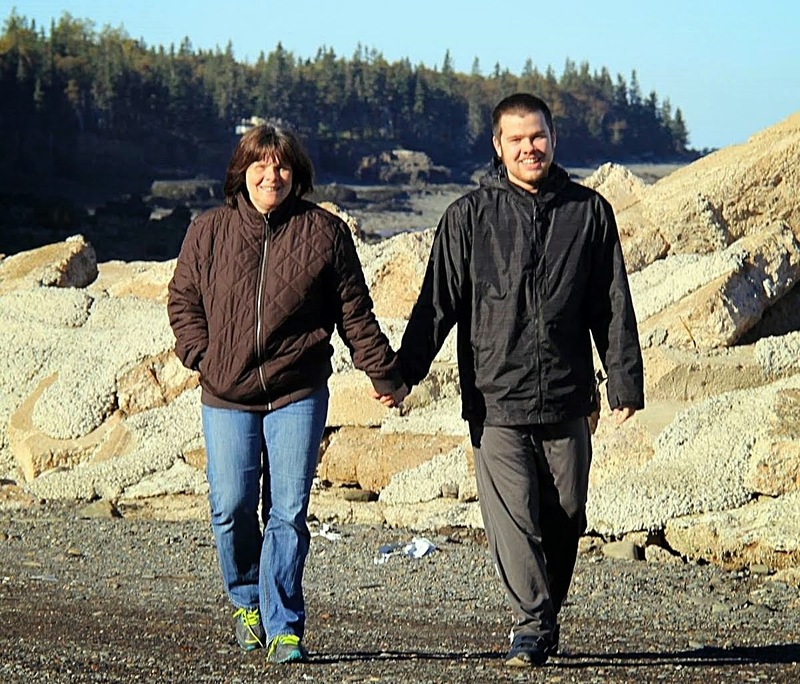 The Neurodiversity Hub is not kind to autistic persons like Jonathan Mitchell, Jake Crosby or Stephanie Lynn Keil, those who think for themselves, look to improve themselves and overcome their deficits. By their words they have proven false the implied claim by some self appointed autism disorder spokespersons that all persons with autism do not want to be cured. For a different perspective on autism self advocacy visit Stephanie Lynn Keil's blog site A Grand Illusion and check out her art work at Stephanie Lynn Keil. I received a harsh comment today about Day 1 of Conor's visit to Grammy and Grampy's that I rejected for publication. 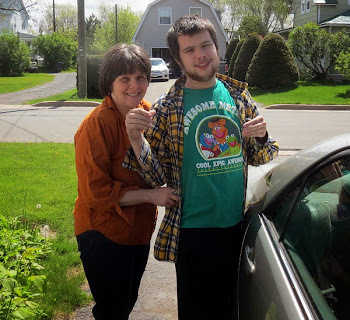 The comment argued that Conor's difficulties on his first day at his grandparents' house proved that ABA does not work and predicted a dismal future for Conor. The comment was poorly reasoned, indicated that the commenter has never read what I have said about Conor's severe autism or the progress he has made. The over stimulation and excitement of Day 1 subsided somewhat today and Conor had a great day as shown in these pics at Grammy and Grampy's today. The top picture is out of focus but shows a big Conor smile so I included it. (I also included the shot of the Crow flying overhead outside our motel because I love crows - smart, beautiful birds). 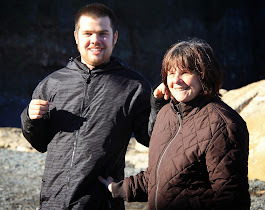 The pictures below show, taken yesterday during day 1 of our visit with my parents in Nova Scotia, show some progress Conor has made of late. Conor, in recent years has been unable to come into the home of either his Nanny, (Conor's mother's mother) or the home of my parents. At both locations he would hide in the bathroom or come out with his eyes closed and ears covered. These were people and places he had always loved but could no longer be with. When Conor has not seen someone with whom he once spent time he often reacts this way as he did with former therapists and aides whose company he used to enjoy but had not seen for awhile. It is as though these people aides, therapists, grandparents are all part of earlier chapters of a book and their presence in a new chapter disturbs the story line. In the pictures below Conor does come into the living room albeit with his ears covered. He did look around the room taking it in. This might not seem like much to many people but to this Dad it is a great improvement. Conor was stressed though and I did not put him through it too long. Back at the motel Conor relaxes, as he does every night at home watching JEOPARDY!® with "the host of JEOPARDY!® Alex Trebek! " (and with Dad too). I am not always impressed with national and international media coverage of autism spectrum disorders. I have often been critical of CNN and CBC for their dilettante coverage of autism disorders and their periodic rediscovery and presentation of the same tired Neurodiversity rhetoric that has argued against the UN declared rights of autistic children to treatment for their autism disorders. But the mainstream media does, occasionally, do an excellent job reporting autism as was the case with the Vancouver Sun series Faces of Autism which offered comprehensive coverage of the autism spectrum including the challenges facing low functioning autistic persons and their families. Another, more recent, exception can be found in Autism Story Changes Policy For All Georgia Students in which 11 Alive News of Atlanta, Georgia pats itself on the back, deservedly, for its media coverage of the school abuse of a non-verbal autistic boy. The coverage prompted action by the Georgia governor to put in place policies to protect autistic children, and other children with disabilities, in Georgia schools. The article also describes the determined and courageous efforts of the boy's parents, Marcelo and Carolyn Ferrari, in obtaining proof that the abuse occurred at school and fighting off a bureaucracy that was more devoted to defending itself, and attacking the parents, then in bringing out the truth and protecting children at school. Autism Story Changes Policy For All Georgia Students confirms the important role that parents play in protecting our autistic children. It also confirms that the media, particularly local media, can play an important role when it is prepared to get involved and practice real journalism. Some things will never change. In another year, and the year after that, and so on, some one sitting in a plush, comfortable chair at the CBC's National offices will, probably "discover", once again, that Michelle Dawson, Ari Ne'eman, Alex Plank and Amanda Baggs do not want to be cured of their autism and Aspergers Disorders. Hopefully though real journalists will continue to roll up their sleeves and provide relevant and important coverage of autism realities like that provided in Faces of Autism and Autism Story Changes Policy For All Georgia Students. 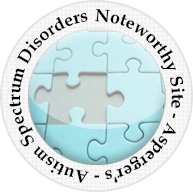 Parents, and real journalism, can make a difference, a positive difference, in the lives of persons with autism disorders. Autism Cure Research Underway? Or Have We Given Up? Parents of autistic children have searched for effective treatment, and preferably a cure, for their autistic children for many years. To date only Applied Behavior Analysis, ABA, enjoys strong evidential support as an intervention that can help autistic children learn skills, improve their ability to communicate and reduce problem behaviors. But, as a strong supporter of ABA intervention for autistic children I do not suggest that it is a cure. Possible cures and treatments, such as HBOT, stem cell and chelation do not enjoy any substantial evidential support as treatments for autism disorders and can involve risk to the autistic person undergoing treatment. But what studies, if any, are currently underway exploring possible treatments or cures for autism? A planned chelation study was abandoned on the basis of risk to child participants in the study. Do we really need to spend charitable and tax dollars to finance the latest Mottron-Dawson group study promoting the ability of a small group of High Functioning Autistic persons to out perform a small group of non-autistic persons on one specific test? As a parent I am constantly amazed at some of the things my autistic son can learn and do on his own but his overall understanding of language and the world and his ability to function in it are limited. Do we really need to fund studies to tell us that parents of autistic children suffer additional stress levels from the extra child raising challenges presented by raising autistic children? Do we need yet another genetic study to tell us that there is a strong genetic basis to autism while ignoring possible environmental factors? As the parent of a 13 year old boy with Autistic Disorder, assessed with profound developmental delays, a boy who stims but does not produce choreographed Internet videos about stimming and "autistic" language, I would like to see research done that might have some actual value to my son. It would be nice to see research that actually helps the intellectual functioning, the understanding of the world, ability to function in the world, of those autistic persons who do not appear before the Supreme Court of Canada, the Canadian Senate or CBC and CNN cameras. It is long past time that research money was spent on ways to help autistic persons overcome their deficits. If we study genetics we will find genetic bases for autism. If we study problem solving abilities of High Functioning Autistic persons we will learn more about the the abilities of HFA persons. If we fail to study causes of, and look for cures for, autism then no cure will be found. And those who claim that "the notion of curing autism is nonsensical" will win by default and our autistic children will lose. Across North America parents of autistic children continue to fight for ABA services for their autistic children whether it be American parents seeking to have private health insurers provide coverage of ABA treatment or parents in Ontario seeking to have ABA introduced in the school system or get their pre-school children off waiting lists for early ABA intervention. Yet the anti-ABA activists would have you believe that these parents are gullible, stupid people who have been misled by an evil ABA industry into believing that ABA will turn their autistic children into "normal" children. Very few of the anti-ABA activists ever describe any personal experiences they have had with ABA. (There are exceptions, some determined anti-ABA activists are parents whose children apparently did not receive ABA from competent ABA therapists). Even Michelle Dawson, who intervened in the Supreme Court of Canada proceedings in Auton to offer an "autistic" perspective and to oppose government funding of ABA treatment for other people's autistic children, did not describe any personal experiences that she had with ABA. Nothing I have read in the writings of most anti-ABA activists refers to any personal ABA experiences on which they based their opinions. Nor do their descriptions of ABA reflect any real first hand knowledge of ABA. The absurd rhetoric of the anti-ABA activists often paints a false picture of ABA as being abusive. Some resort to an old video clip of an aversive (hand slapping) being used in an ABA session to portray ABA as abusive. ( Such commentaries invariably ignore the once widespread use of a particular aversive "the strap" that was once used on ALL school children, including me in Grade 1, when I was strapped for kicking a soccer ball around the classroom during a brief absence by the teacher. I never did it again). The Internet criticism of ABA as an autism intervention comes largely from a rejection of evidence based medicine, ideological based rigidity and lack of any real experience with ABA. To the anti-behaviorists no ABA supportive studies are acceptable unless they are double blind controlled studies conducted over the life time of autistic persons. Obviously it would be unethical to provide a placebo intervention to an autistic child as an intervention over a lengthy period of time. 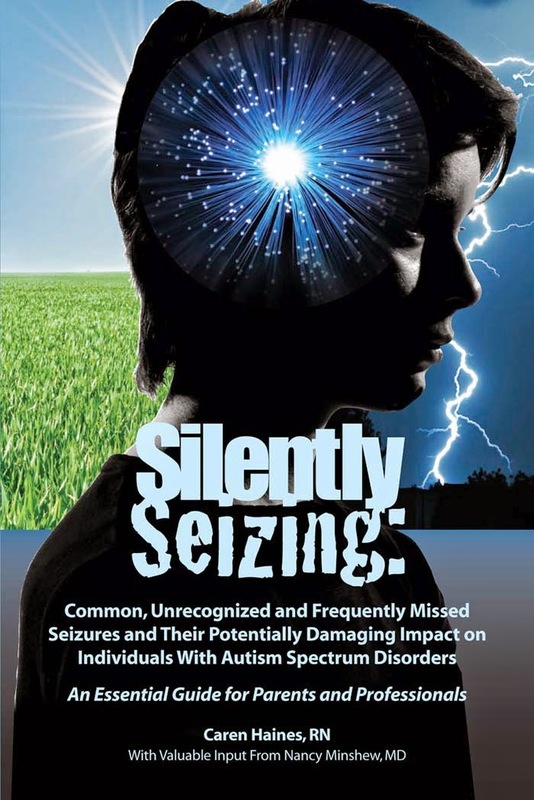 The various studies described by the American Academy of Pediatrics, the US Surgeon General, state agencies in New York, California and Maine, the Association for Science in Autism Treatment, the Center for Autism and Related Disorders, the May Institute and the thousands of health care and education professionals who actually work with and help autistic children will be ignored by the anti-ABA ideologues. There is no need to mention of course that the direct observations of autistic children by their own parents who live with their children, care for them, help them and observe them 24/7 are of no weight whatsoever to the ideologues for whom NO information supportive of ABA could ever be acceptable. Some of the anti-ABA rhetoric originates with adult persons with various autism spectrum disorders who themselves have had no actual involvement with ABA. The further removed from the realities of ABA and the need for an effective intervention that helps autistic children the greater the chance that the irrational anti-ABA ideology will take root. 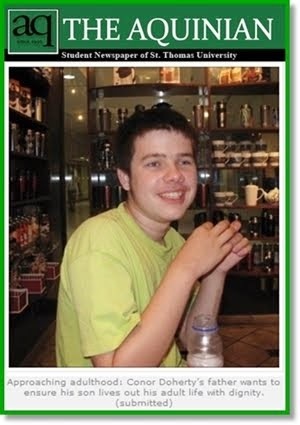 The criticisms themselves are largely non-evidence based and ignore the many positive contributions that ABA has made to the lives of autistic children including my severely autistic son Conor. 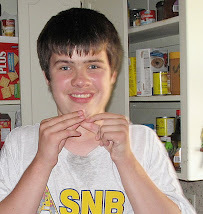 Conor has learned various skills, reduced self injurious behavior, increased communication skills, attended a neighborhood school and functioned well. 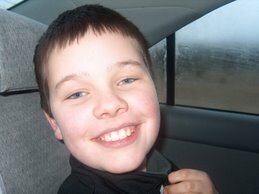 On the sidebar of this blog are pictures of Conor holding his perfect attendance certificate from grade 6 during which time he received ABA instruction at school. This year colds and a flu prevented him from perfect attendance but his desire to attend school did not diminish. He loves school ABA and all. Why would Conor jump up each day eager to attend school where he receives ABA intervention if it was so abusive? I post many picture sets of Conor on this blog site over the past 3 years. These portray him as what he is -- a very happy, personable and lovable boy. ABA has not turned him "robotic" or robbed him of his personality. There is nothing at all abusive about ABA for autistic children, certainly not for Conor, despite the absurd rhetoric of the anti-behaviorists. Conor is now 13 1/2 years old and stands 5' 11''. In the past year and a half he has undergone the adolescent "change of life" with rapid growth spurts and all the other changes that can be so disruptive of young personalities in the teen years. While there are some challenging behaviors at times there is nothing out of the ordinary. Despite his growing size, strength and disruptive adolescent changes he is still a very well behaved, gentle young man. We have not felt the need to provide Conor with ANY medications at any time to manage his behavior. Although he used to bite himself with some frequency, and still does on occasion, such self harmful behavior is rare. He does not return home at the end of a day at school and engage in self injury as a way of coping psychologically as one prominent anti-ABA activist testified that she would do at the end of the work day. The ideologues can blame ABA intervention for Conor's near elimination of self injurious behavior or they can pretend that my direct observations about the impact of ABA in reducing such behavior are of no weight. No need to guess which way the anti-behaviorists would lean on that choice. 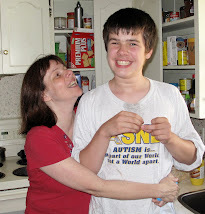 Conor has received NONE of the medications prescribed for many autistic children. The anti-ABA ideologues can also blame ABA for that result but they won't. They don't really want to look at the issue objectively. They do not want to look at the whole picture including the benefits ABA has brought to my son or other autistic children. If you are the parent of a newly diagnosed autistic child consult your attending health care professionals about the best way to help your child. Make any treatment or intervention decisions with their input but do not be turned off of ABA as a possible intervention to help your child by the anti-ABA rhetoric that permeates some Internet autism hubs. Most of such rhetoric emanates from people with no direct involvement in helping autistic children. Most of such rhetoric emanates from people with no actual experience with ABA. Most of such rhetoric emanates from people, whether they fancy themselves researchers or not, who just don't know what they are talking about when they are talking about ABA. Do not be misled by the misbehavior of the anti-behaviorists. In the meantime I am looking forward to another day with my wonderful son who has benefited greatly from his ABA intervention. Conor will probably also enjoy the day ... without the need to injure himself so that he can "cope psychologically" ... and without medication.